This issue of Clinics in Plastic Surgery, guest edited by Drs. 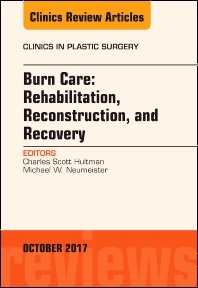 Charles Scott Hultman and Michael W. Neumeister, is devoted to Burn Care: Reconstruction, Rehabilitation, and Recovery. Articles in this issue include: Role of Physiatry in the Management of Chronic Pain; New Concepts in OT, PT, RT: Focus on Functional Cutaneous Units; Rehabilitation in the Acute vs Outpatient Setting; Role of Anesthesia in the Management of Chronic Pain; Pathophysiology and Treatment of Hypertophic Burn Scars; Laser Modulation of Hypertrophic Scars; Fat Grafting for Burn, Traumatic, and Surgical Scars; Peripheral Neuropathy and Nerve Compression Syndromes; New Frontiers in Skin Grafting: The Painless, Scarless Donor Site; Tissue Rearrangements: The Power of the Z-pasty; Prefabricated Flaps for Burn Reconstruction; Microsurgery: Timing and Indications in Burn Patients; Hand Reconstruction: Functional Results; Head and Neck Reconstruction; Vascularized Composite Allotransplantation: Hand and Face; Ethics in the Setting of the Burned Patient; Psychosocial-spiritual Needs of Burn Patients; Aftercare, Survivorship, and Peer Support; Global Health Initiatives, Public Policy, and International Missions;Outcomes: Scar Scales, Physiologic Metrics, Measuring QOL; and Big Data: EBM and Best Practices.